At his death in 2000, R. S. Thomas was widely considered to be one of the major poets of the English-speaking world, having been nominated for the Nobel prize for Literature. With Dylan Thomas, R. S. Thomas is probably Wales's best-known poet internationally.Tony Brown provides an introduction to R. S. Thomas's life and work, as well as new perspectives and insights for those already familiar with… the poetry. His approach is broadly chronological, interweaving life and work in order to evaluate Thomas's poetic achievement. 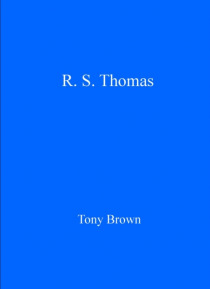 In addition to presenting a full discussion of Thomas's poetry, and its movements over time between personal, spiritual and political concerns, Tony Brown also examines Thomas's contribution to the culture of Wales, not just in his writing but also his political interventions and activism on behalf of Welsh language and culture.